As the chicken cooked this evening, my roommate commented that roasted chicken always smells like home; I could not agree more. The sizzle of fat drippings, the bite of garlic, the earthiness of rosemary filled the apartment with an overpowering feeling of home. And that’s ultimately what we try to create with food, isn’t it? A sense of place. Roasted chicken to reminisce about our childhoods, curry to transport our taste buds, chocolate cake to deliver us to utopia. My hope in cooking all these meals is that those places, those memories, those flavors will permeate the walls of this apartment, combining to christen this place, my new place. These memories, for better or worse, are inextricably linked to food. It’s my escape, my recollection, my self-expression, my outward expression of love. What I mean to say is that I encourage everyone reading this post to cook. Anything. Just try it. Then try it again. Meals, like the one I shared tonight with a few close friends, possess the powerful effect of bringing people together. And when you make them yourself? They incite a unique form of pride–simultaneously sustaining and entertaining. But let’s get to the good stuff. This chicken. I made the Zuni chicken recipe from Smitten Kitchen, along with her version of the restaurant‘s bread salad. 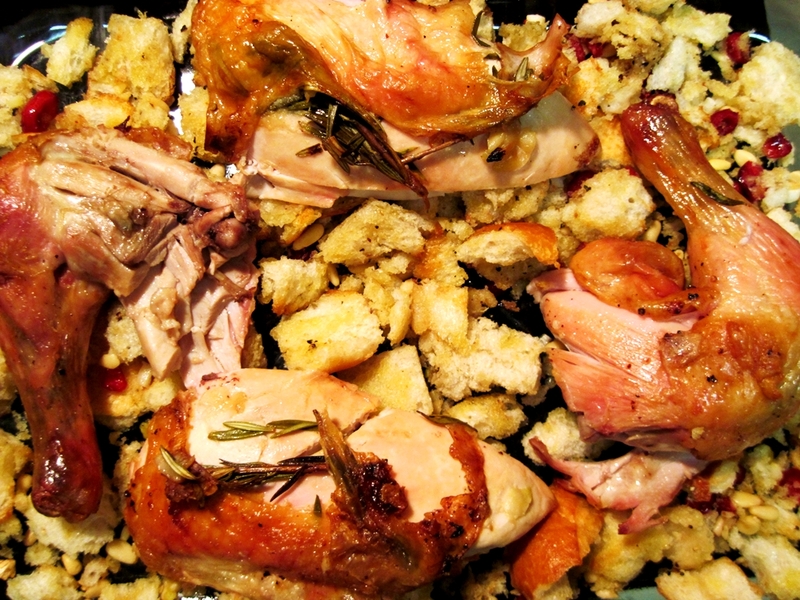 (Glorified stuffing, but significantly better.) The recipe is quite long (but still relatively easy, I promise! ), so I’m just going to link to it. No point in repeating someone else’s fine work. One thing I would like to add about raw, whole chicken–it’s disgusting. It reminds me of what Benjamin Button would’ve looked like when he was born if he’d been born without a head–goose-pimpled and pale, with saggy skin. Don’t let that deter you. Any food with that kind of dismal first impression surely cannot end worse than it began, right? I followed the recipe pretty consistently, with a few notable exceptions. 1) I also tucked smashed garlic cloves, along with rosemary, under the chicken skin before wrapping and refrigerating it. 2) Right before cooking the chicken, I rubbed it with butter. And then I placed a few small pats of butter beneath the skin, as well. Somewhere above, Julia Child is beaming. 3) I didn’t put greens in the bread salad ’cause I was serving a salad on the side. More greens seemed superfluous and overly, well, green. Anyway, I’ve waxed poetic long enough. I would, however, like to know: What’s your favorite food memory? 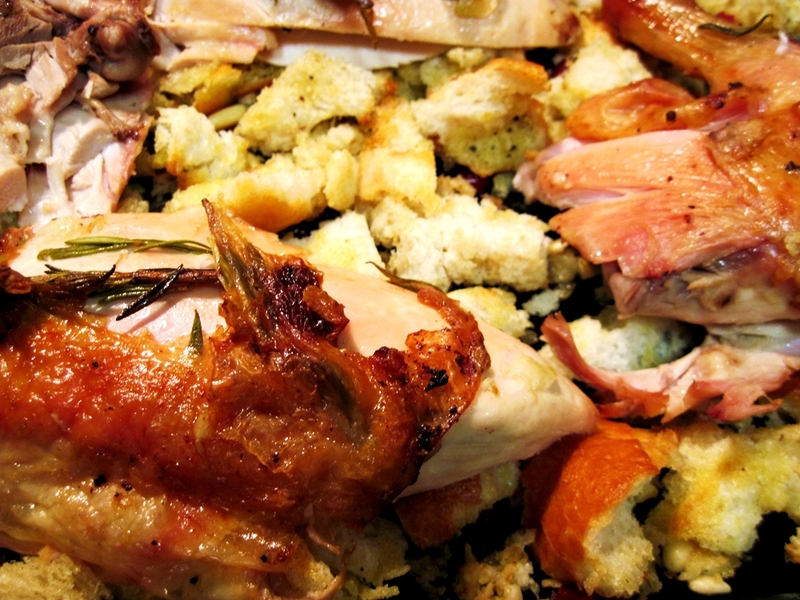 This entry was posted in poultry and tagged bread, chicken, cranberries, pine nuts, rosemary. Bookmark the permalink. Oh my goodness, this turned out FANTABULOUS!! It looks amazing! Loved your post! And the chicken was truly “fantabulous”!